Designer Alyssa Terpstra liked the Dinora wood coffee table from The Mine because it has two levels. 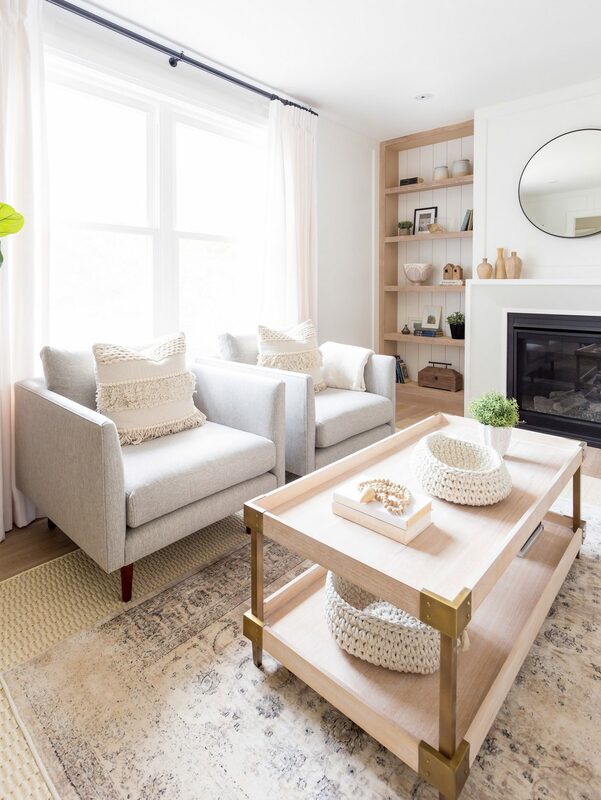 The unique mantelpiece is her own design; the shiplap backing for the built-in shelving units adds a relaxed feel. 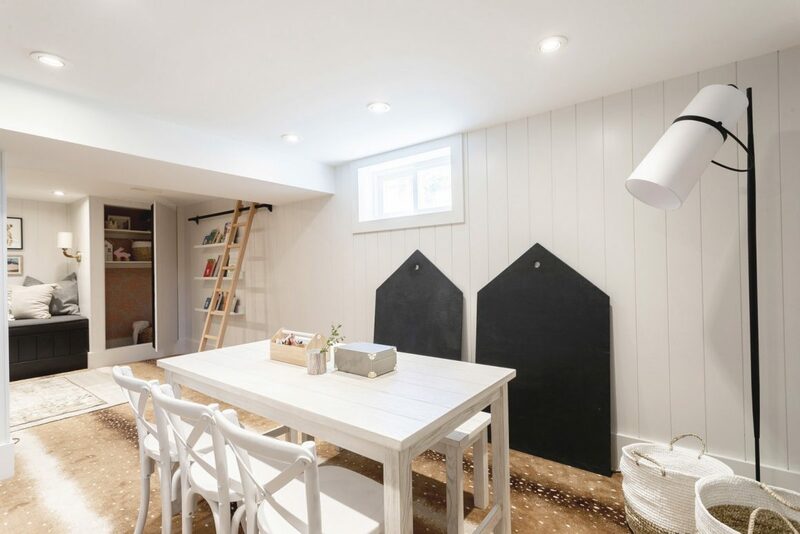 The family’s pretty house in Ancaster had no grave flaws when they moved in almost two years ago, but “it’s a war home, so it’s very basic,” Alyssa says. 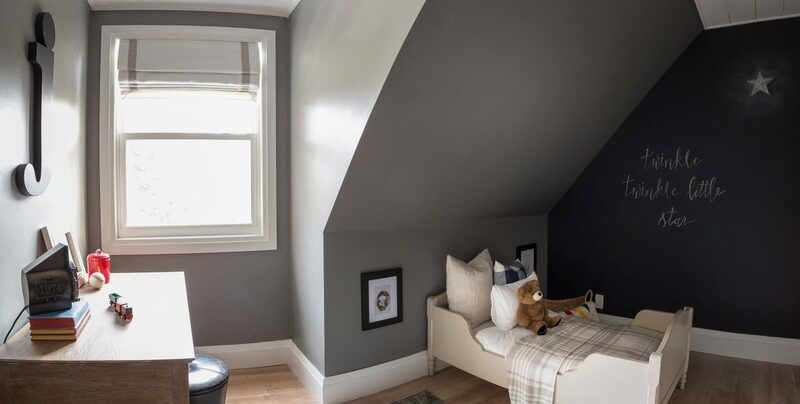 Four rooms were redone over the course of two years for the One Room Challenge, a twice-yearly online showcase of room makeovers by sponsored and guest designers. 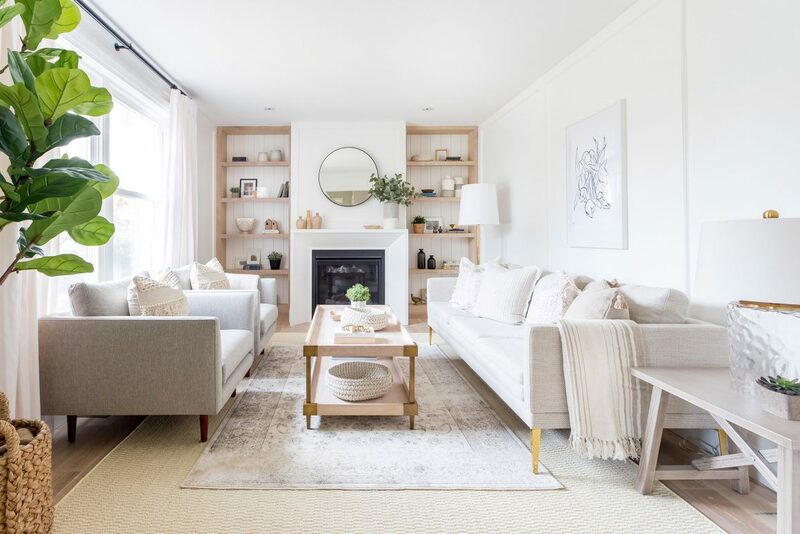 The living-room layout boldly challenges the idea that exact symmetry is to be avoided. 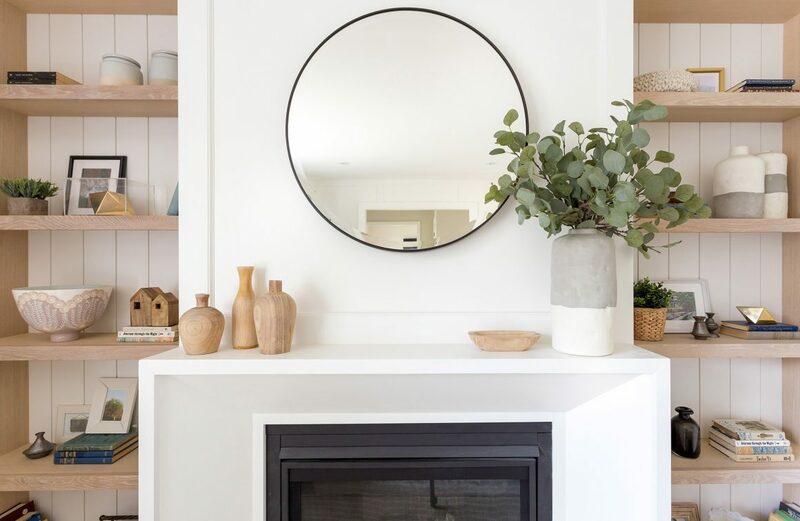 The two halves of the space are almost identical: a round mirror is centred over the fireplace and flanked by a pair of matching shelf units. 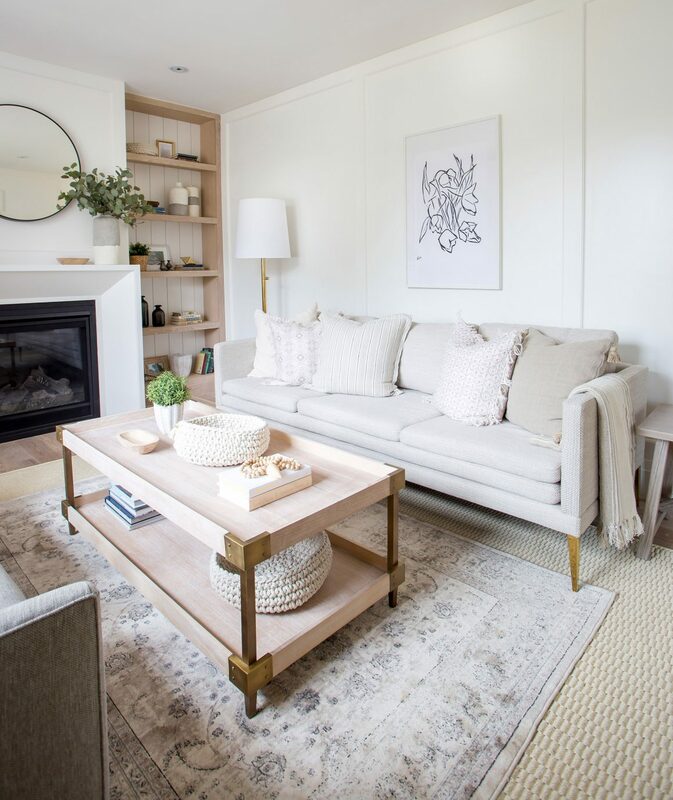 A simple rectangular coffee table inhabits the middle of the room; a pair of grey armchairs faces a sofa. However, a lively arrangement of decorative touches — basketry, ceramics, artwork and textiles — breaks up the strict regularity. The plump white pillows on the chairs and sofa echo the colours and natural textures found in the other elements of the room. A focal point is a bowl that was custom-painted for the space by Boston ceramist Jill Rosenwald. 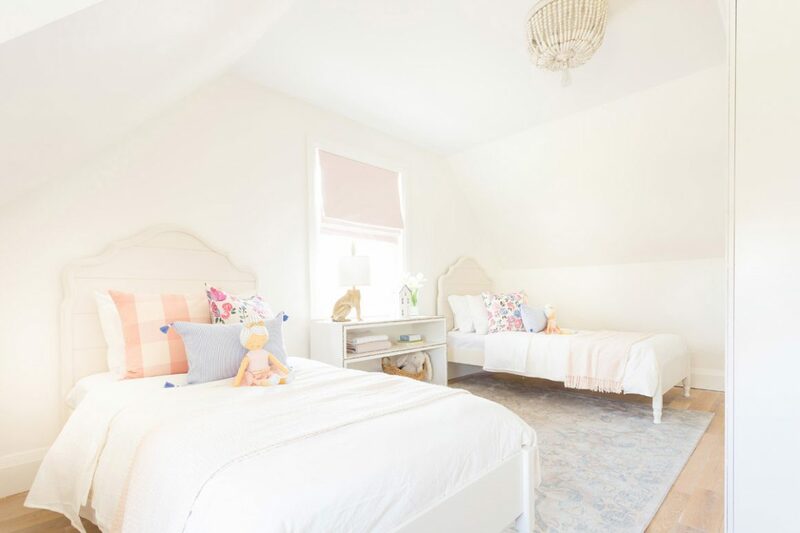 Upstairs, the girls’ room, with windows on two walls, glows with a delicate light. 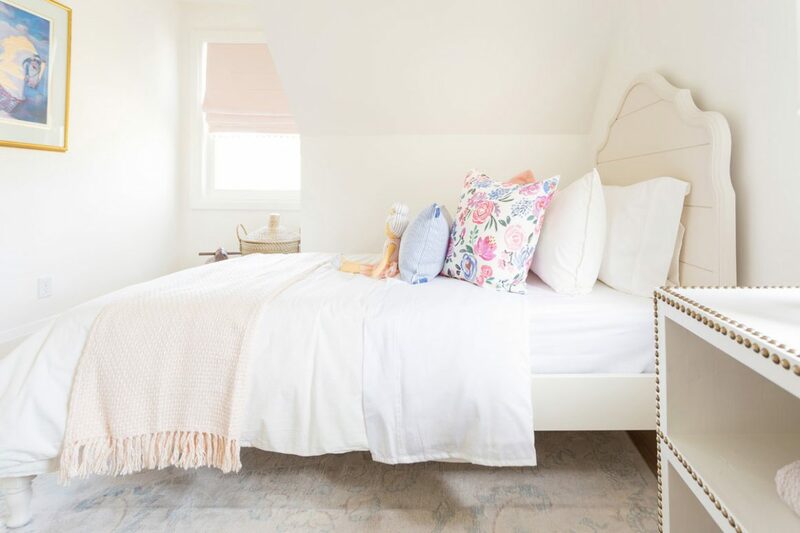 “They were both born in the spring, so that’s why I wanted to go with the florals,” Alyssa says, but flowery elements are limited to a few key touches, such as Caitlin Wilson’s cheerful Joie des Fleurs cushions, inspired by flower markets in the south of France. 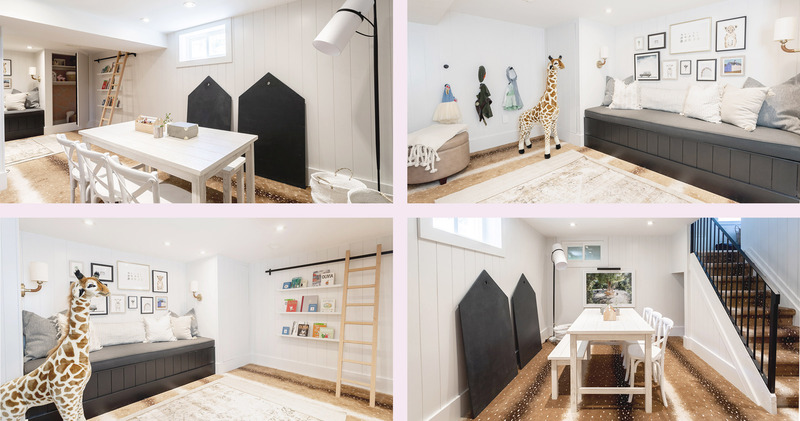 “It was really hard to find something that would go under the window,” says Alyssa, so the storage unit (top right) was custom-built by husband Steve. 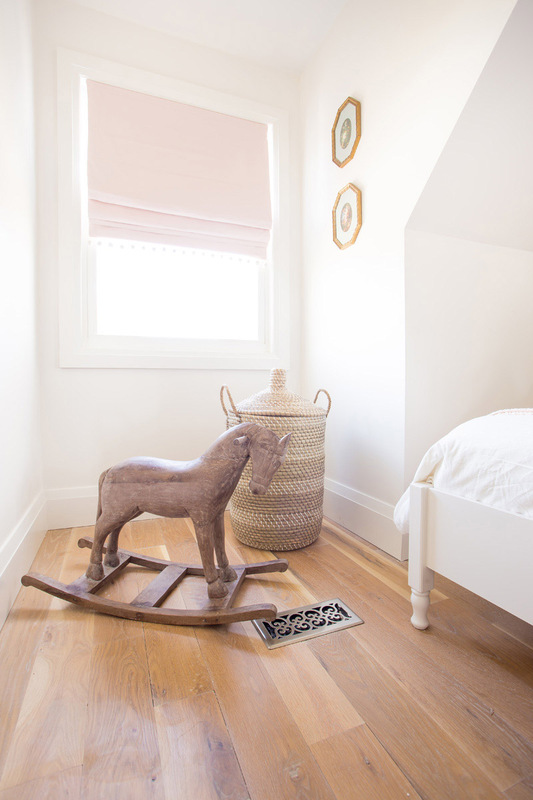 A rocking horse from RH Baby and Child has antique-style charm. 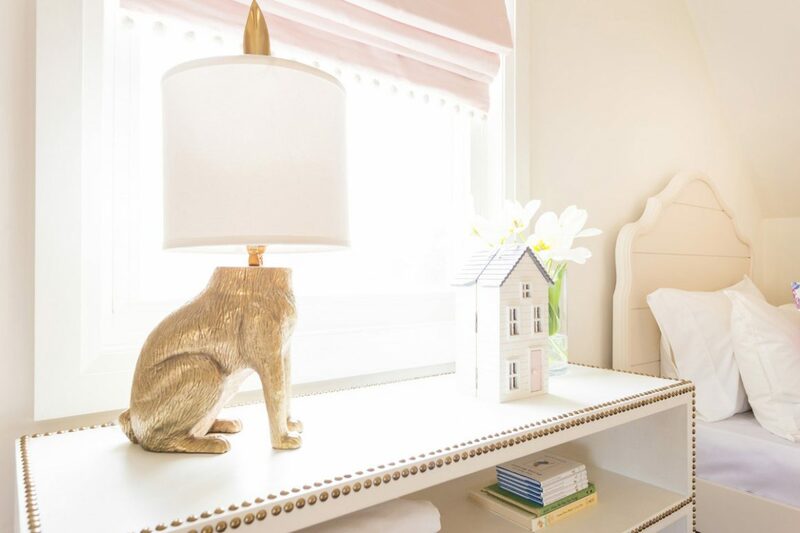 Other springlike details include the humorous Emily + Meritt Bunny table lamp from Pottery Barn Kids, and Anthropologie’s All Ears knobs on the closet doors. Prints of a catcher’s mask and baseball reflect his love of sports, while such items as the elegant adjustable leather barrel stool from RH Teen are distinctly designed to grow up with. Alyssa’s eldest daughter requested the sliding library ladder. 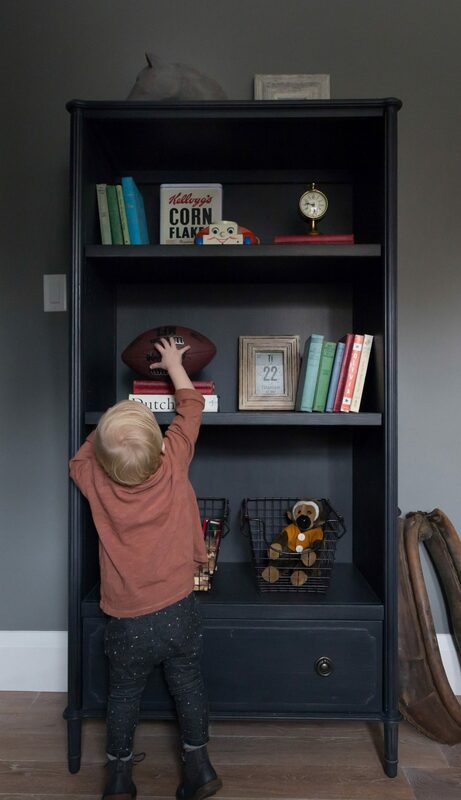 Simple black wall hooks from Emtek and a lightweight taupe faux-leather storage ottoman from HomePop turn an alcove into a costume cupboard (top right). 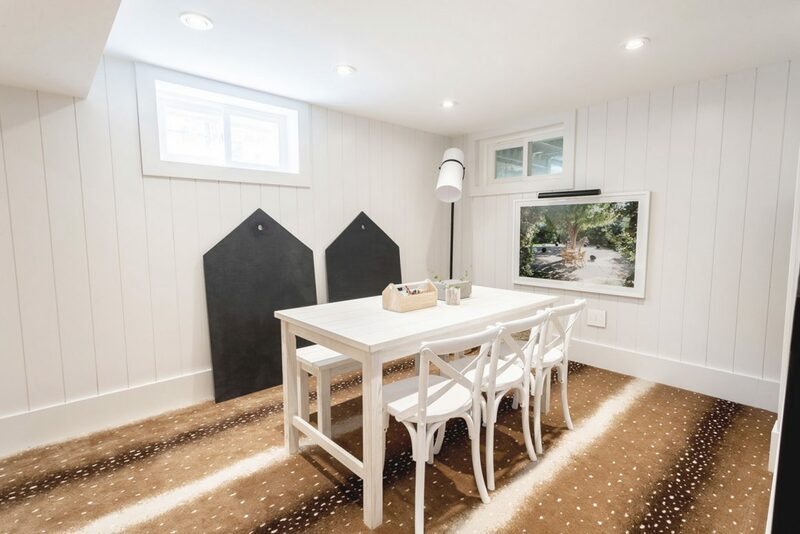 The children had the strongest say in designing their whimsical basement playroom, where the old linoleum was replaced with a unique carpet: Karastan’s Savanna Scenes Ashen Antelope pattern in brash stripes stippled with pale spots. “The kids loved that pattern, and I loved the idea that it would be really forgiving with spills and dirt,” she says. 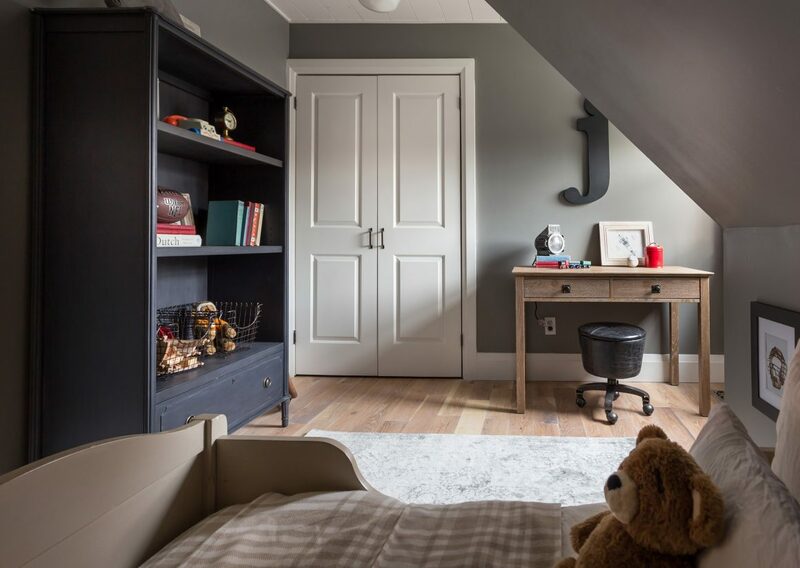 A play table for drawing, a miniature workroom, and a series of hooks for dress-up costumes let the children indulge in creative play, while an irresistible reading nook allows for comfy quiet moments in which to curl up with cushions. “One thing they were really excited about was hidden rooms,” says Alyssa. 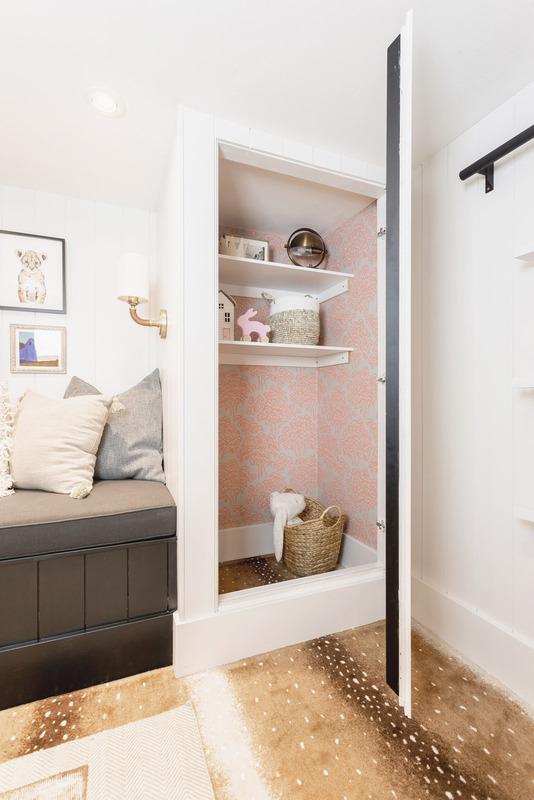 Two secret closets, lined with Farrow and Ball wallpaper chosen by the children, flank the reading niche. 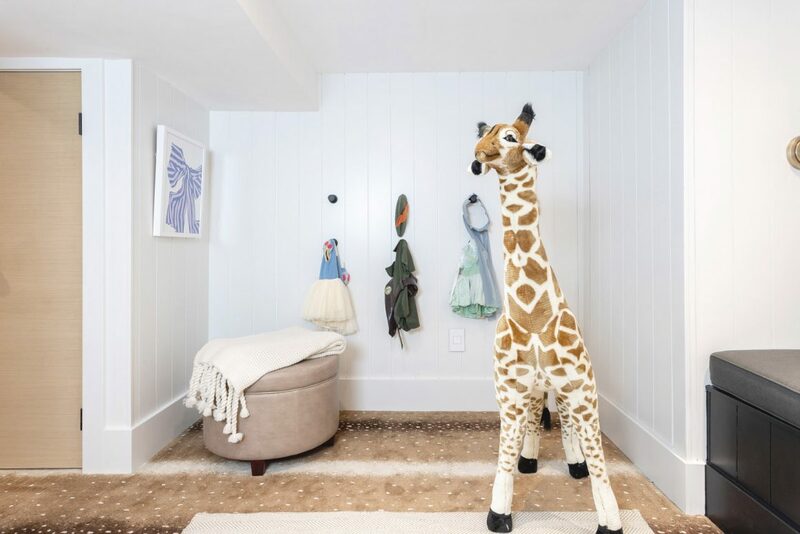 The children also helped choose a large colour print by American fine art photographer Gray Malin called “Hide and Seek,” which shows a zebra incongruously visiting the Parker Palm Springs Hotel. 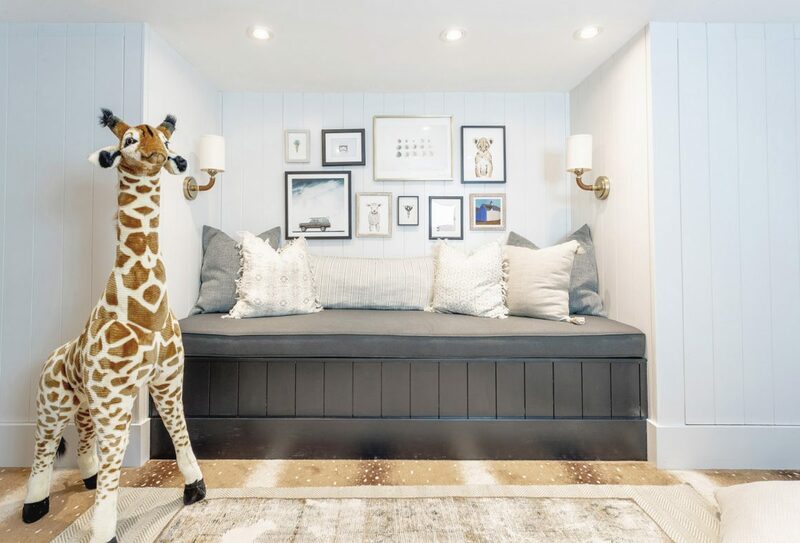 A giant stuffed giraffe carries through an understated safari theme.